Wayne Caffarel, DTM has worked as a Pathways Ambassador and Pathways Guide, recently receiving his DTM. Wayne has won Triple Crown awards and was successful as a Club Coach. Wayne is always willing to give a helping hand. Wayne is retired from the Navy where he served 20 years. He moved to Georgia with his present wife in September of 1999. Wayne was reluctant to join Toastmasters because the club in Waycross met at 7:30 in the morning. Shortly after the club changed to a lunch hour meeting he joined. One year after joining he earned his CC award. The next year he earned two awards and then a triple crown. Finally in the fourth year he earned two more leadership and communication awards. He served as Area G-74 Director in 2015- 2016. In June of 2016 he was assigned as a Pathways Ambassador and in January of 2018 became a Pathways Guide for 8 clubs in Division H. At the same time that he was working as a Pathways Guide and Ambassador he Coached Toastmasters of Richmond Hill to Presidents Distinguished in 2017-2018. With the coaching position filled the request for ALS and DTM were submitted. On July 27th of 2018 he received his DTM award and Coaching certificate. Wayne is now working in two paths (Effective Coaching and Dynamic Leadership) towards his next DTM award. 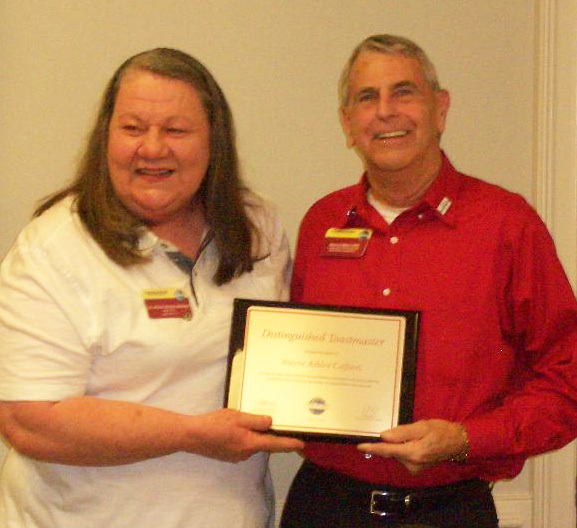 Hello Wayne, thank you for all your service to District 14 Toastmasters! Congratulations on being honored as our Spotlight Member for the month of September! I know you love Toastmasters – I remember you travelling 3 to 4 hours one way to help out a club by attending their meeting. That’s dedication and a strong sense of service to your fellow Toastmasters. Thanks for all you do.